Acclaimed by Great Plains Quarterly, “Sod and Stubble by Ise ranks with Giants in the Earth by Rolvaag and O Pioneers! by Cather in readability and memorability,” and reveals both the dark side and the heroism of pioneering. 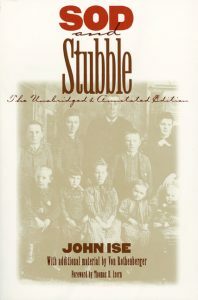 Originally published by John Ise in 1938, Von Rothenberger added extensive notes, along with more material from author Ise, including the fate of the family after the events of the book.